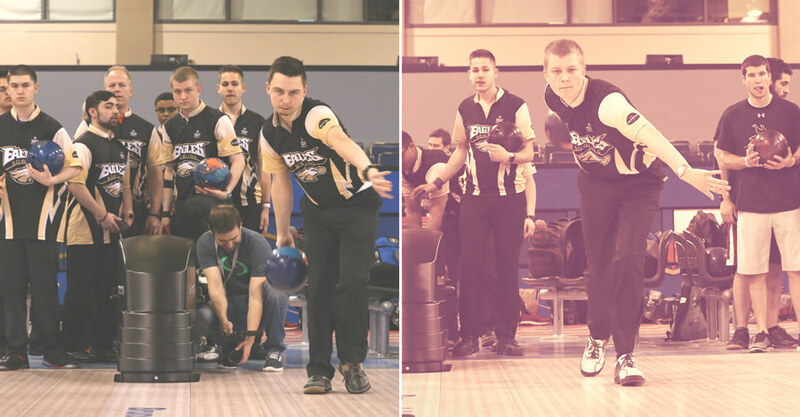 What is your favorite part of collegiate bowling? My favorite part of collegiate bowling has to be the team feeling. My teammates have become a second family to me and I can always count on them for anything. What is your preparation routine before a big event? Practice 4-5 days a week for an hour to an hour and a half each time. How often are you/your team working on your game(s)? What is teamwork? What does it look like on the lanes? Teamwork is breaking the lanes down as a team, and always trusting one another. Another key to teamwork is a lot of communication and understanding how one person see’s a lane differently than another but using the information given to make the best decisions possible. How important is the physical and mental game? Is one more important than the other? You have to have both. One is not more important than the other. If you have an amazing physical game and no mental game you will never dominate, if you have an amazing mental game but not the best physical game you will never dominate either. The best bowlers in the world have to have both or they would never make it on the tour. How does Storm (or Roto) and their products help you and your team? Roto Grip helps our program by providing us with the best equipment in the sport. Having the best equipment in the sport gives us a big advantage against our competitors. Roto Grip has a wide variety of shapes that match up to college patterns phenomenally. What is your life like as a collegiate athlete? What does a typical practice session look like at your program? Our varsity team all practices on the same pair of lanes everyday. Each of us is working on our own game but the others are watching and helping each other out. Our coach DJ Hayes is always behind somebody helping them understanding something new everyday. Right around February we start to do bakers everyday and start practicing Monday-Friday. Are there mandatory workouts at your program? If no, how do you stay fit? We do not have any mandatory workouts, but most of us live in the same building downtown and it has a gym. For us it’s all on your own but if you do not take care of your body you will never reach your full potential, just like in every other sport. How close/far is/are the practice facilities? From the school it is a 10-15 minute drive, or up to an hour depending on Chicago traffic , but if you don’t have a car it is a train ride and then you connect to a bus. Depending on how well you connect the 2 it could be as little as 40 minutes or it could take you up to and hour and 20 minutes. How interactive are your men’s and women’s teams? Our teams are very interactive off of the lanes but when we are practicing we only practice 1 or 2 times a month together. The other days in the month the girls do there own thing and the guys do there own thing. What is your favorite Storm bowling ball? Why? My favorite Storm bowing ball has to be the Torrent. I love my Torrent because for me it is such a benchmark ball that rolls nice and even. Also it is the ball that helped me place 6th individually at the Hoosier this year and got me to the ISC for the 2nd year in a row. How do you pick your limited (5 or 6 balls) arsenal for collegiate tournaments? I make picking my arsenal for college tournaments really simple. What is it like competing against friends on opposing teams? It’s really fun! I’ve known some of these guys since I was 10 and to grow up with them and experience college bowing together is a true blessing. It’s always nice to have bragging rights if you win, but the friendships you make in bowling are like nothing else and they will create life long friends, and that’s the important thing. Is it possible to have a job at your program while going to school full time, bowling most days a week, traveling, etc? Yes it is possible, some kids work nights after practice from like 6-10 or shifts, or some work on Monday and Friday’s when we don’t have practice. All of our van rides to and from tournaments always have some funny moments in them. The best was on our way to a tournament and Michael Martell was sleeping in the first row of the van. We are driving down the road and a tow truck was hauling a semi so that the semi was facing us. On the count of 3 we all screamed so that Michael would wake up and when he did he started freaking out because he thought the semi was coming right at us. That was a great laugh. What’s one thing that a high school bowler should know before going into college that may surprise them? Learn time management skills in high school. You will use time management more than you would ever imagine.